Welcome to my first post from our new home in Somerville, Mass! We have finally settled into the new digs and our going about business as usual. My man has left the pizza business and is working with craft beers in a retail setting, so expect to see some more beer pairings as our refrigerator overfloweth. 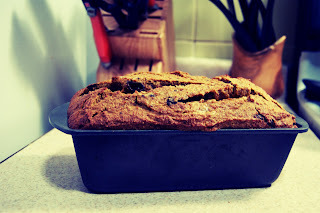 Every fall I make Pumpkin Chocolate Chip Bread. So, our first settled weekend in town we wanted to celebrate with a warm, homey fall breakfast. We tend to make French Toast a lot when we want to brunch at home, so this idea came together as something that was originally two separate recipes we wanted to make. The pumpkin bread is a pretty simple quick-bread to assemble. We made the french toast while it was still warm from the oven, and had to slice it a little thicker because it tends to be a bit crumbly when hot. Also, we didn't have chocolate chips on hand so I chopped up a delicious Chocolove XOXO 70% Dark Chocolate bar instead - a definite improvement! To make the bread: Preheat oven to 350 F. Cream the butter and gradually add sugar, beating well. Add eggs one by one and beat mixture. Stir in pumpkin and water. 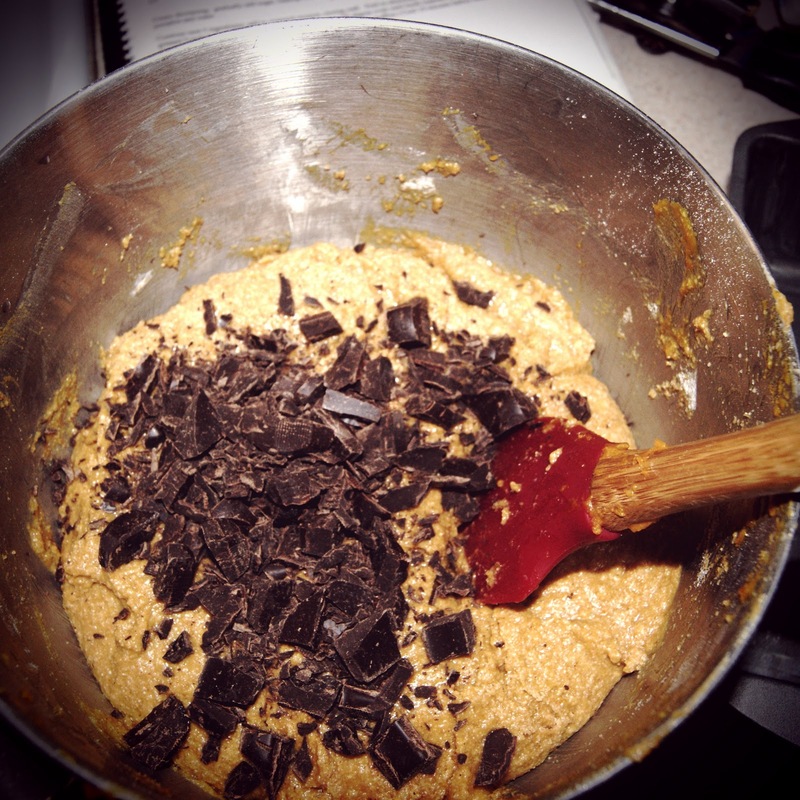 Combine the rest of the ingredients and add to the creamed mixture. Fold in the chocolate. Spoon mixture into a greased 9 inch loaf pan and bake for about an hour or until a knife inserted into the middle of the bread comes out clean (except for maybe some melty chocolate). Slice the cooled bread into 1/2-1 inch slices. In a bowl, mix together eggs, milk and vanilla extract. Heat frying pan or griddle to Med-Low heat. 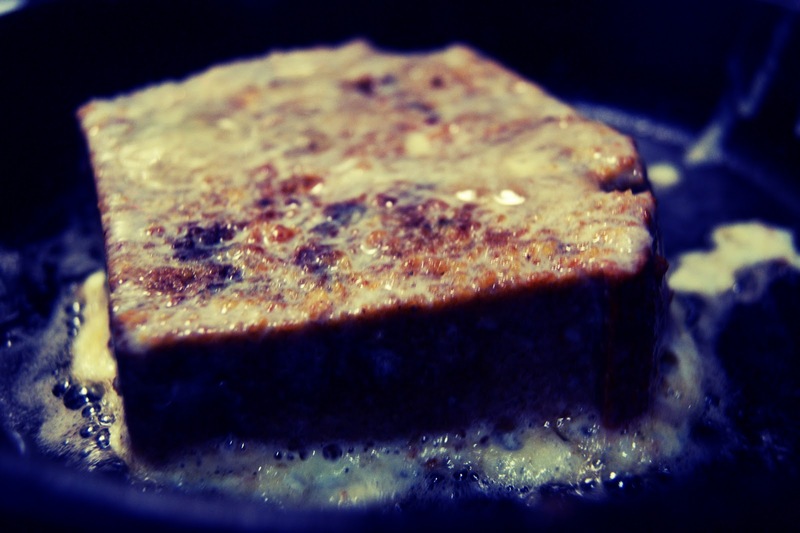 When pan is hot, melt the butter in it- enough to coat the bottom of the pan. Dip each slice of bread, making sure to coat each side and the ends and place in pan. Cook each side for about 5 minutes. You may need to reapply butter if you're working in smaller batches. If you're making a lot at once, keep a ceramic plate in the oven @ 200-250 F and store the cooked slice in there until you're ready to serve. Mix together cocoa and spice mix, sift over plated bread. 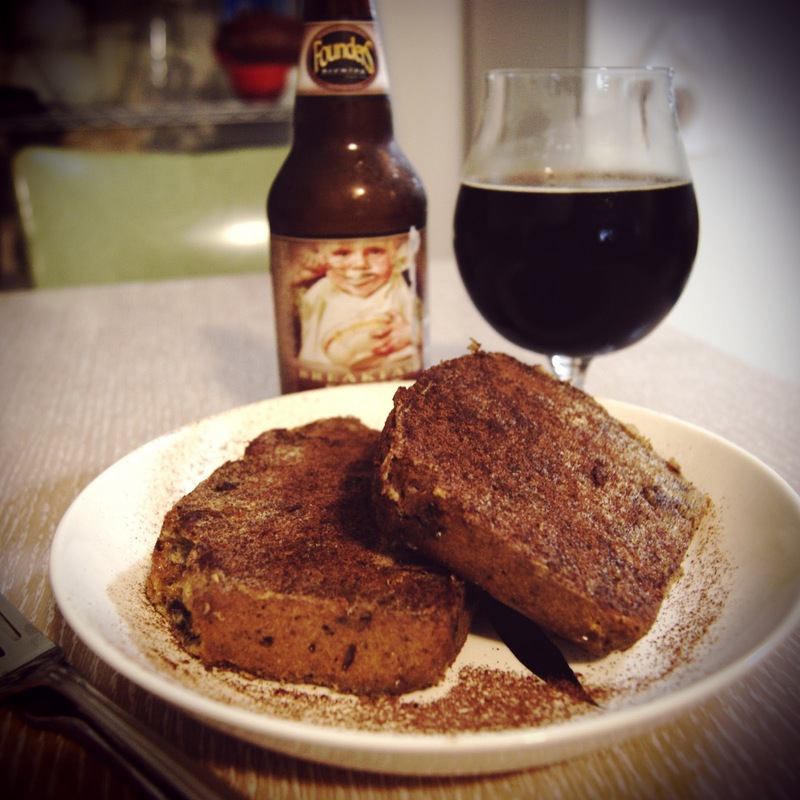 Eat with maple syrup and a delicious breakfast beer like the Founders Breakfast Stout or your favorite fall seasonal beer. Um, YES please. I will make this for my Hallowe'en party. Congratulations on moving to Massachusetts! It's my favorite state and a good place for quality pumpkins. YUM. Dark chocolate chips sounds like a great idea. Just stumbled upon your blog...As a lover of food (and stoner food) and blogger of beer, I look forward to reading more. Cheers! While there is a sure flavor in the stripped fire cooking when that fire originates from charcoal you can truly taste the distinction.